It was a moment that caught the Labour party conference off-guard. Sixteen-year-old Lauren Stocks had just received her GCSE results and wanted to talk about the toll that changes to the exams had taken on her and her classmates. In a passionate speech, she articulated the scale of the mental health problems that blight her generation. "There's a statistic we were shown when I was about 13 or 14 that told me three in 10 people in every classroom suffer with a mental illness. Using strong language, she denied that to be the case. "It's a good half. "I could've walked into any food tech, history, art, maths classroom and just watched seas of spaced-out, stressed-out, depressed kids, in a battlefield where they can't afford pens and paper," she said, gulping hard. "It is a disgusting sight," she told delegates, and urged parents of teenagers with newly-reformed GCSEs ahead of them to make sure they know they are loved. Her audience were on their feet, cheering Lauren for a speech that's since been shared thousands of times on social media. "It felt pretty weird," she tells the BBC. "I was kind of in my own little world. "To see everyone stand up - I really appreciated it." And the plaudits didn't stop there. "My Snapchat blew up," she says. About 30 people from her old school contacted her to say they were really glad she had spoken up for them. "I have suffered with many a mental health issue. I was worried it was just me but the response was overwhelming." Some social media users though, with characteristic brutality, were less than warm, criticising her choice of hair dye and appearance. The impact of these negative comments is something her mum, Sarah Hilton, worries about a lot but Lauren less so. "They're saying: 'That's not a girl'. "When I checked last night, I was definitely female," she says, laughing it off. She also diplomatically brushes off the inevitable parallels being drawn with a famous 1977 Conservative conference speech by another 16-year-old, which was watched by a smiling prime minister-in-waiting - Margaret Thatcher. "I haven't seen the speech but I have studied William Hague," she says. "I don't have the best opinion of him." Despite her years, Lauren is no stranger to public speaking. 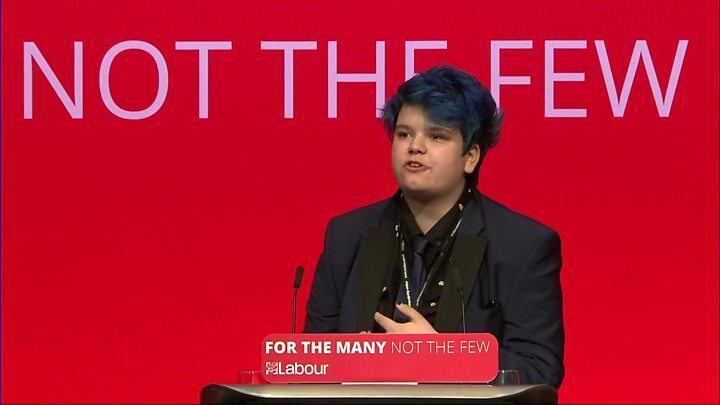 Now under-19 representative for North West Young Labour, she has been an activist for two years. Her interest in politics was first piqued at 12 as she idly watched YouTube videos of people discussing left-wing ideas. After a brief dalliance with the Greens, she joined the Labour party on 3 August 2015. "I remember if as if it were yesterday," she says, almost wistfully. A few weeks later, Lauren received an email asking people to attend a Manchester food bank that leader Jeremy Corbyn would be visiting. "I asked mum if I could go. I'd never been into Manchester alone before. "My mum dropped me off at the food bank and after that they kept me involved," she says. After her experience of sitting the new GCSEs, she says students should be empowered and told what they can achieve, not threatened that if they fail, they'll be left watching Jeremy Kyle all day. This year's GCSE students in England were the first to sit exams which were numerically graded and tougher than in the past. The changes, introduced by former education secretary Michael Gove, resulted in a dip in results, but schools minister Nick Gibb said pupils and teachers were rising to the challenge. Exam regulators said the new qualifications had allowed students to better demonstrate their abilities and had better prepared them for further study. A Department for Education spokesperson said: "We recognise there are challenges facing the profession including a more demanding curriculum and higher expectations for pupils. Where staff are struggling we trust head teachers to take action to tackle the causes of stress and ensure they have the support they need. "The government has also taken steps to reduce the burden of exams on young people including removing multiple, pointless resits and investing £1.4 billion in children's mental health services". Conference was, Lauren admits, a fast-paced eye-opener but also a chance to meet her heroes, Dennis Skinner ("soon-to-be Sir"), writer and activist Owen Jones ("I love him so much") and Laura Smith ("a rising star who I hope to see in Cabinet"). For all her enthusiasm for politics and its people - and despite lobbying from her mum - she is not certain that's where her future lies. Lauren is now studying history, sociology and politics at college, and plans to stand for council in 2019. But beyond that, she says she has no political ambitions. "If it's meant to be, it's meant to be."